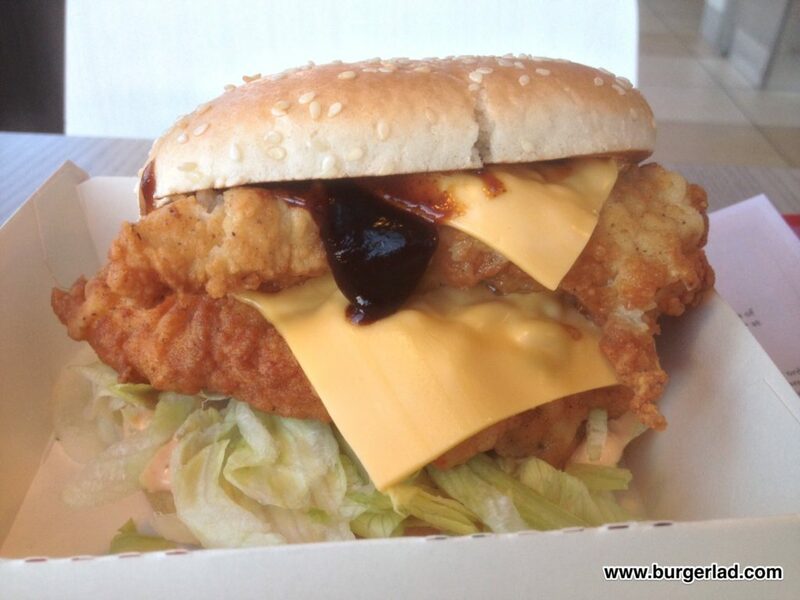 Two fillets of our classic original recipe chicken, sandwiched between cheese, barbecue and all-new baconnaise sauces. In case you missed it, on Monday 10th October 2016, KFC released the new Original Recipe Stacker (our original post below). 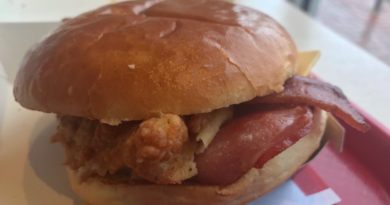 We managed to get to our local restaurant the very next day to check out a brand new double chicken fillet burger which features a first for Kentucky Fried Chicken in the UK – baconnaise. Firstly the promotional box – this is a big box, and I mean B-I-G. It quite possibly dwarves the McDonald’s Big Tasty box in terms of size and the sandwich (or burger) inside matches its exterior packaging. So much so, that the Stacker looked like it was trying to escape! Opening the lid/out of the box the build certainly looks impressive. 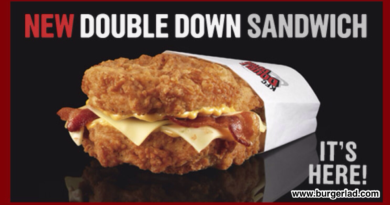 Looking at it I couldn’t help but think “Double Down with buns”. 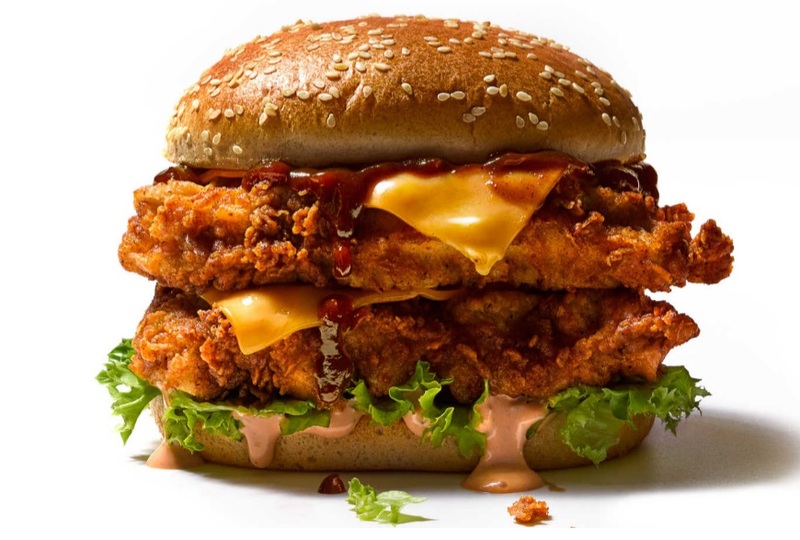 Picking up this weighty burger, the bun, especially the heel, is just starting to feel the strain of the stack of ingredients, which includes, from the heel – baconnaise, lettuce, chicken fillet, cheese, chicken fillet, cheese and BBQ sauce. Most people will probably be interested to find out about the new baconnaise. I must say, I was quite a fan of it. It’s fairly smoky and creamy with a mild bacon flavour. Certainly not as strong as the GBK variety… but a welcome addition to the growing arsenal of burger condiments available to The Colonel. I was concerned that the baconnaise would be overpowered by the BBQ sauce and it is a close call on that front. I’d certainly like to try it without the BBQ element but together this gives for a smoky, bacony-bbq sandwich/burger from KFC. In terms of the original recipe chicken fillets, there’s not much I need to go into that you don’t already know. It’s a good High Street standard of white chicken breast meat with the signature coating and with two fillets provides a) good value and b) a substantial sized burger which should satisfy your appetite… depending on your greed tolerance. It’s good. I like it. 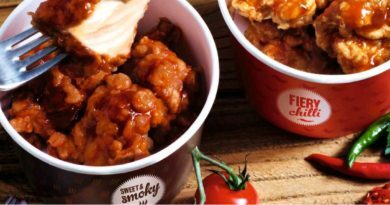 And another step in the right direction by KFC whose burger innovation we questioned in our 2016 KFC Wish List. Note items six and ten have since become reality amongst some pretty unrealistic requests. 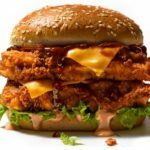 KFC’s Original Recipe Stacker is certainly a BIG burger for BIG appetites and is definitely recommended. Priced at £4.99 it offers pretty good value for what you get and is both enjoyable and tasty. Like I mentioned above, I couldn’t help but look at it and see it as a Double Down with burger buns. The meal comes with fries and a drink and is priced at £5.99. The baconnaise is a welcome feature and luckily doesn’t quite get domineered by the BBQ sauce, but that is hovering on a border-line decision in that respect. 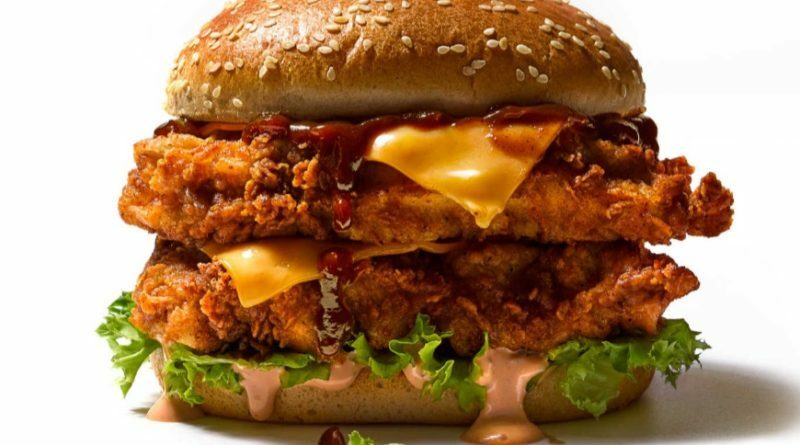 What I would say is that it definitely needs a more robust bun for the sheer volume of ingredients on-board which would see it cope better with the stack of chicken, cheese and sauces. And if you do go out and try this, whatever you do… grab plenty of napkins! The KFC Original Recipe Stacker is available until Sunday 27th November 2016 at participating restaurants only while stocks last. 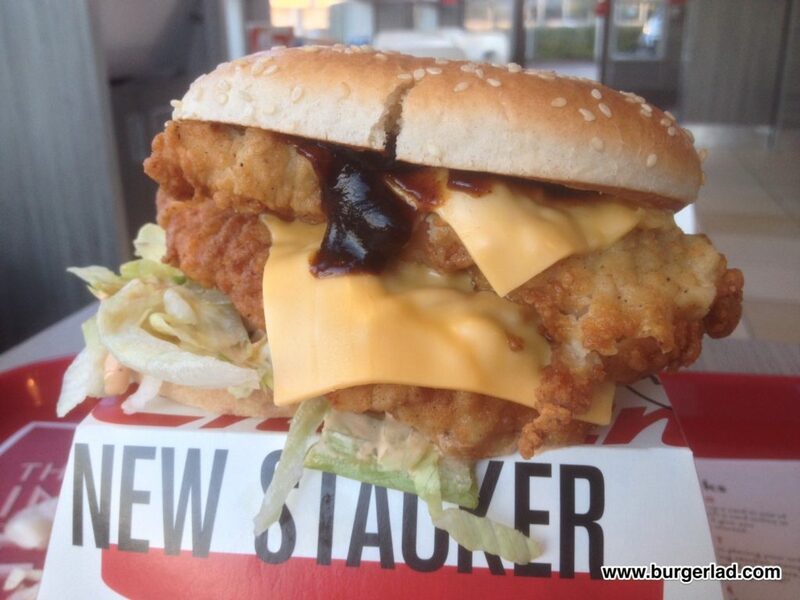 From Monday 10th October, KFC UK have released the Original Recipe Stacker. Alongside the news that KFC have launched a breakfast menu at ten select restaurants in the UK, the latest LTO is available from today. The Original Recipe Stacker clocks in at 745 kCal. The KFC Original Recipe Stacker is similar to the previously released Bacon Lovers burger in New Zealand and the current Cheese & Bacon and Zinger Double Stackers in France. 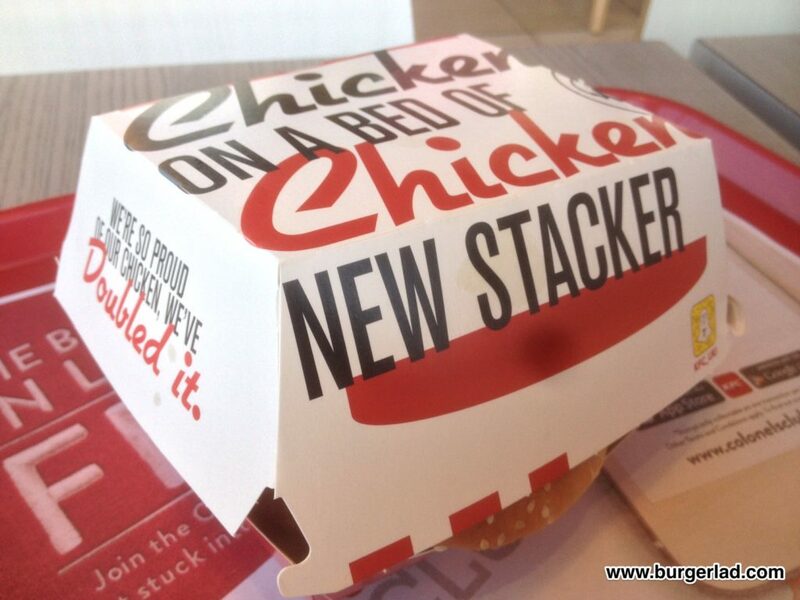 What do you think of the new KFC Original Recipe Stacker? 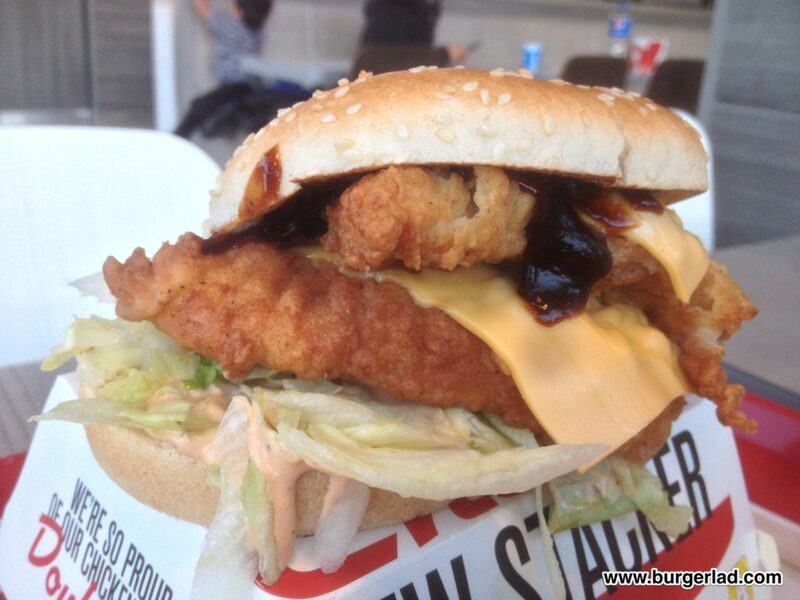 We’ve seen two fillet burgers before like on the Zinger Stacker – are you a fan? What do you think of Baconnaise making its first appearance on a UK KFC burger? Review to follow as soon as we can! Tried one today, on the whole I enjoyed it. Major gripe however was that I did not realise until too late that I purchased this at one of the halal trial branches, so no bacon or baconnaise on my burger. Disappointing…. Just means I will need to give it another go! @Coxy – It does not come with Bacon anyway so you did not miss out on that just the Baconnaise and I read that it actually contains no bacon so your burger should have contained it. You should complain to customer services maybe they will give you a voucher for another one free. Just another example of us having to adapt to the the minority of the new arrivals. I wonder if there are non halal places in Islamic countries. Sounds like my sort of burger.